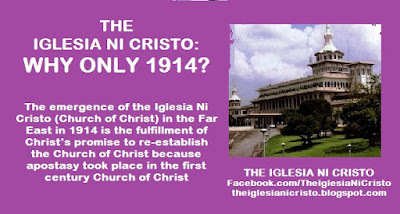 THE IGLESIA NI CRISTO: Iglesia ni Cristo: Why Only 1914? The Lord Jesus Christ indeed established His Church when He was still here on earth. The Church Of Christ was built by Christ in the first century in Jerusalem. However, apostasy took place. The first century Church Of Christ was apostatized by false teachers. It was the Lord Jesus Christ Himself who warned the first century Christians that many of His disciples will be led astray (cf. Matt. 24:9-11). But, the Lord Jesus Christ also promised that He is going to rebuild His Church (cf. John 10:16). Thus, we believe that the emergence of the Iglesia Ni Cristo (Church Of Christ) in the Philippines in 1914 was the fulfillment of Christ's promise that He is going to rebuild His Church. These are attested by prophecies written in the Bible. “5. Did Jesus Christ establish a Church? It was the Lord Jesus Christ Himself who said that His disciples will be persecuted and put to death, and multitudes will be led astray or will be deceived. Thus, when the Lord Jesus Christ said in Matthew 16:18 that “the gates of Hades will not overcome” His Church, it doesn’t mean that there will be no apostasy that will took place. It is the Lord Jesus Himself who said that “multitudes” of His disciples will be “led astray” by “false prophets.” What does our Lord Jesus Christ meant in saying that the gates of Hades will not overcome His Church? According to Apostle Paul, “Even from your own number men will arise and distort the truth.” He is referring to “bishops” of the Church (cf. Acts 20:28). Also, Apostle Paul said that the apostasy will occur “after I leave,” referring to his death (Cf. Acts 20:29-30, 24-25 and 37-38; I Tim. 4:6-8). Thus, the apostasy will take place after the death of the apostles or after the apostolic period (first century AD). Those who will led astray the multitudes of the disciples, who will distort the truth and secretly bring destructive heresies inside the Church, and called by Apostle Peter as “false teachers,” will come from "among their ranks" (among the bishops). Take note that the apostles prophesied that after their death (after the apostolic period) or those will come immediately after them, were those that will led astray the Church. The Catholic Church claims that they are the successors of the apostles. According to Apostle Paul, “some WILL TURN AWAY FROM THE TRUE FAITH; they will follow deceptive spirits and teachings that come from demons.” Thus, apostasy took place when the Church departed from the true Christian teachings and embraced "different teachings" (teachings not upheld by true Christians, not taught by the Lord Jesus Christ and His apostles, not written in the Bible). Apostle Paul wrote, “...giving heed to seducing spirits, and doctrines of devils...Forbidding to marry, and commanding to abstain from meats.” These are some of the signs that the Bible gave so that we could recognize the fulfillment of the apostatized church: they followed the doctrines of the devil of forbidding to marry and abstaining from meats. Thus, when the Church Of Christ of the first century departed from the true faith and followed the erroneous teachings (teachings not taught by the Lord Jesus Christ and His apostles, and not written in the Bible) like clerical celibacy and abstaining from meat, she became the Catholic Church. This is the reason why it’s the Catholic Church that continued up to this day - the first century Church Of Christ was apostatized and transformed into Catholic Church. Although the first century Church Of Christ will be apostatize, the Lord Jesus Christ said, “other sheep I have.” He called them His “other sheep” because they “are not of this fold.” He will bring them also and they will hear His voice and they will be “one flock.” The “fold” or “flock” the Lord mentioned refers to the “Church Of Christ” (Acts 20:28 Lamsa). Thus, when the Lord Jesus said that He has other sheep “not of this fold,” what He meant is that He has other sheep not of THIS Church Of Christ (referring to the first century Church Of Christ). The "other sheep" mentioned by the Lord Jesus Christ in John 10:16 are not of the Church Of Christ of the first century. Remember that the first century Church Of Christ was apostatized. The Lord promised that “them also I must bring.” He also said that “there will be one flock.” The word “flock” is referring to the Church Of Christ. Thus, the words of the Lord Jesus Christ saying "Other sheep I have which are not of this fold, them also I must bring, and they will hear My voice, and there will be one flock..." refers to His promise of rebuilding the Church Of Christ. This verse shows that the Church Of Christ the Lord established is composed of three groups of people: (1) "For the promise is unto you" - the Jews (cf. Acts 2:36); (2) "and to your children" - the Gentiles (cf. I Cor. 4:6); and (3) "and to all that are afar off, even as many as the LORD our God shall call." The Bible said, "bring my sons from far, and my daughters from the ends of the earth." The children of God that will come from afar will emerge in the time the biblical prophecy calls the "ends of the earth." “Now as He sat on the Mount of Olives, the disciples came to Him privately, saying, "Tell us, when will these things be? And what will be the sign of Your coming, and of the end of the age?" “So you also, when you see all these things, know that it is near, at the doors! The first sign that Jesus gave as an answer to His disciples’ question about the signs of His return and the end of the world was a war that would be dramatically different from all other wars that preceded it. What would make this war so unique is that the news of its battles would quickly spread both far and wide. This Great War prophesied by the Lord Jesus Christ found fulfillment in the war that was once called “the war to end all wars,” or the First World War which began on July 27, 1914 (Story of the Great War, edited by Francis J. Reynolds, et al. New York: P.F. Collier and Son, 1916. Vol. 2, p. 291). 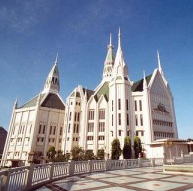 The gap between the first century Church Of Christ and the Church Of Christ that emerged in the Philippines is because the first century Church was apostatized. Although apostasy took place in the first century Church Of Christ, however, Christ promised that He is going to re-establish the Church Of Christ. 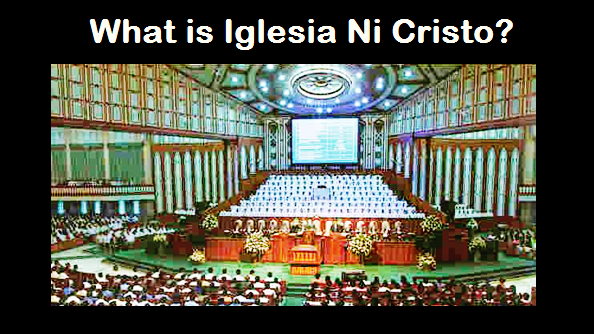 Hence, the emergence of the Iglesia Ni Cristo (Church Of Christ) in the Philippines in 1914 was the fulfillment of Christ’s promise of re-establishing His Church. It's because they can't deny the truth and it's well-explained. napakasarap malaman ang katotohanan. hindi ito kayang tanggapin ng mga nasa sanlibutan pa. Thank you Lord for this... this will strengthen our faith and will help in propagating...just shared this to my mom and to my 2 brothers (who are not yet INC) who are in mindanao through Facebook 'coz i'm in cebu...prayed for God's mercy and forgiveness to open their eyes to the truth.